﻿ Whatever happened to British-built helmets? nce, there was a world before Arai, Shoei and Shark. A different world where the preferred helmets for British motorcyclists were – odd that this now sounds – British. Back in the late ’70s, in motorcycling’s heyday when 17-year-olds terrorised the High Street on 250-strokers, a licence was a Post Office form away and typical biking attire included Doc Marts and a paddock jacket, helmets usually came with union flags on them. Kangol were one of a number of UK helmet firms who flourished in the ’50s, ’60s and ’70s and were famously worn by racers – including Mike Hailwood. Others included Stadium, Centurion, Cromwell, Paddy Hopkirk and Griffin – all of which have disappeared. So what happened? And where did they go? Kangol was founded in the 1920s as a textile firm specialising in headwear, particularly berets (the name comes from K (for knitting) Ang (for Angora) and Ol (from Wool) and was the main beret supplier in WW2, most famously to Field Marshal Montgomery. In the 1950s Kangol diversified into safety products, producing safety helmets and seat belts in Carlisle. 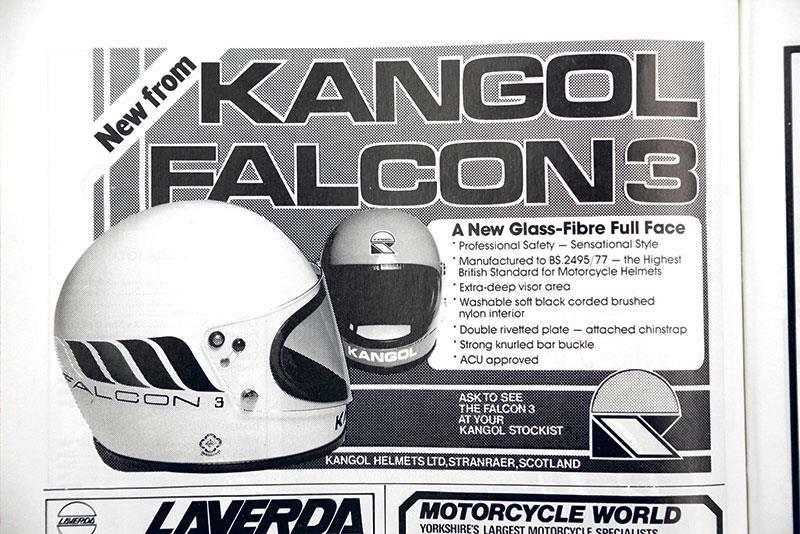 Then, following the helmet law of 1973, Kangol became the UK’s biggest manufacturer, production moving to larger premises in Stranraer, Scotland. What were they most famous for? 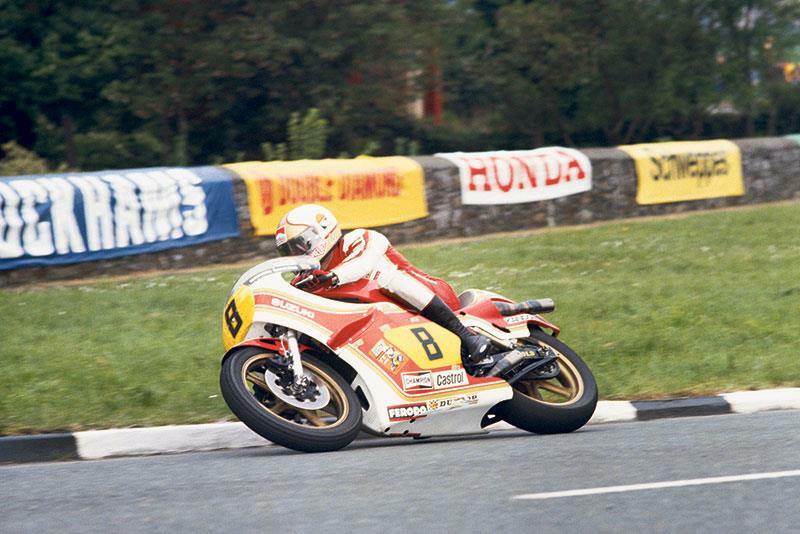 Being the helmet of choice for a generation of riders and racers in the mid-late ’70s, among them John Newbold, Tom Herron, John Williams, Ron Haslam, Dave Potter and even Joey Dunlop. 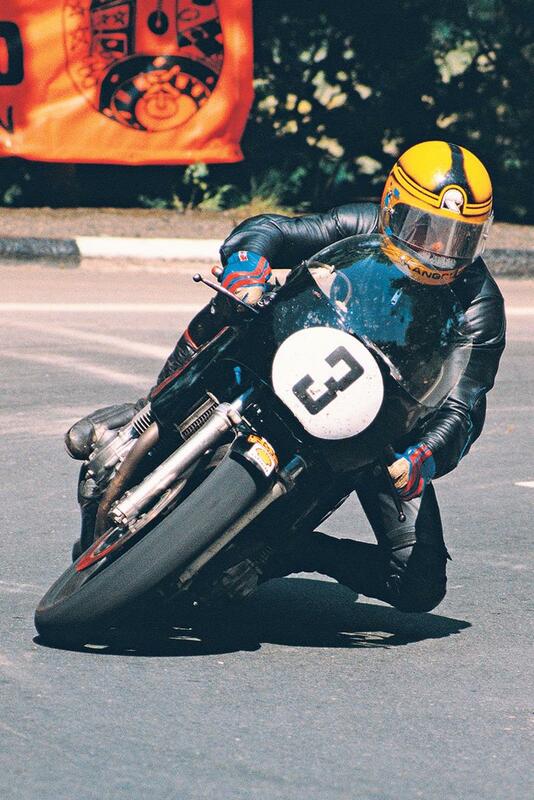 The great Mike ‘The Bike’ Hailwood in his last Isle of Man appearance at the 1979 TT. Wearing a Kangol. Simply, British helmets weren’t good enough – or fashionable enough. The UK industry started to suffer in face of cheaper, or simply better and more sophisticated, foreign imports, first from Europe with the likes of Nolan, Nava and AGV – then from Japan. Most fashionable teenagers wanted a Sheene or Roberts AGV instead. First, in 1981, Kangol Helmets were re-branded as Top Tek, producing the likes of the Nimrod, which fared little better. Then, in 1983, the firm were taken over by industrial helmet specialists Helmets Integrated Systems Ltd (HISL) a leader in military and civil aircrew headgear who, interestingly, had earlier also bought the Cromwell motorcycle helmets operation. Top Tek was dissolved in 1984 and HISL were taken over by American military and civil safety equipment firm Gentex in 2014. Many went the same way. Centurion, of Thetford, Norfolk, began making helmets in the 1950s and were most famously worn by sidecar world champs Jock Taylor and Benga Johansson. By the early 1990s, however, it had withdrawn from motorcycling altogether. It survives today as Centurion Safety Products Ltd making, among other things, workman’s hats. Stadium, an injection-moulded plastic pioneer founded in 1911 best known for its Achilles’ full face from the ’70s, also survives as the Stadium Group in Hartlepool, a leading provider of electronic technologies having ended helmet production decades ago. Others such as Griffin and Paddy Hopkirk went the same way. Sort of. Cromwell lives on, under HISL/Gentex ownership, as a specialist fire and emergency services helmet. While Everoak, most famous for its astonishingly naff full face Casquette and Super Casquette in the ’80s, has been revived, too, and produces £800 replicas of ’50s-style cork ‘bone domes’ for the classic autosport scene. The name has gone from strength to strength – but for fashion clothing and headwear, not helmets. The brand’s been owned by Mike Ashley’s Sports Direct since 2006, with licences sold to may different companies, including TopShop. Kangol hats, meanwhile, remain in production in Eastern Europe and the US. Whatever happened to motorcycle Mega-dealer Carnell?